Happy 2019 and welcome to Burroughs Audubon’s centennial year! Or as I like to call it, “100 Years of Birds and Nature in Kansas City”! As your Historian I will post fascinating tidbits from our group’s past at least once a week this year. I will also highlight some of the “gems” of our library collection in the hope that more folks will come out to see these materials for themselves! I hope you will enjoy these “blasts from the past”. First, a couple of basic facts. Our official birthday is April 15. Before we became Burroughs Audubon Society in 1972, the group began in 1919 as Burroughs Nature Club. Its founding members included many dedicated and knowledgeable birders, but they also had a wide range of other interests and felt it was their duty to educate the general public in all aspects of natural history. Esther O’Connor, our first librarian, had a particular love of plants and flowers (thus the wildflower prairie at BAS Nature Center is named for her). In the 1950s BNC had a Botany Committee with its own schedule of field trips, and Esther held free botany classes at her home in midtown KC every other month to share her passion. 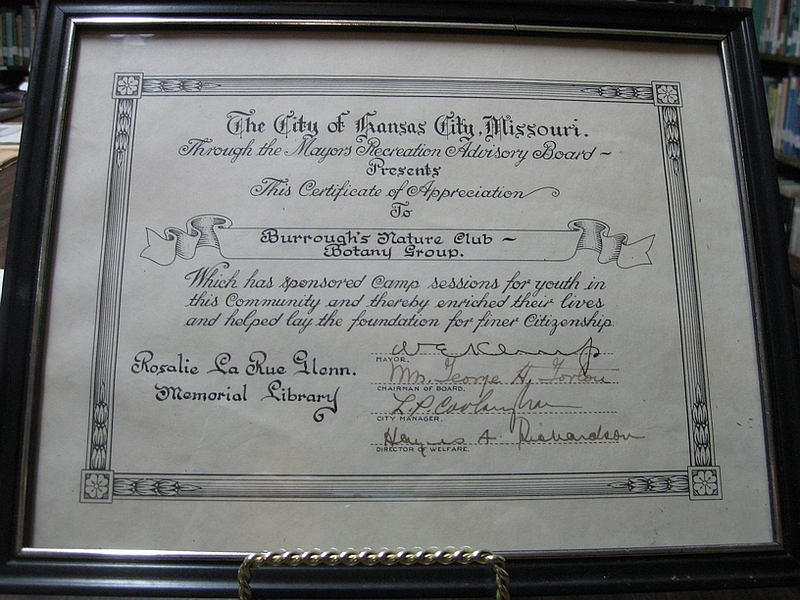 The BNC Botany Group was such a success that it once received a certificate of appreciation from William E. Kemp, the mayor of KC! Unfortunately the document is undated, but must have been issued some time between 1946 and 1955, the years of his tenure in office. It states that the group gave classes for young people, “and thereby enriched their lives and helped lay the foundation for finer citizenship”. Isn’t that a wonderful way to sum up the beneficial effects of nature study? Best of all, we are still engaged in the process today–with Wings Over Weston, with the KC Young Birders Club, with our Bonnie the Biologist classes and all our activities that are free and open to all. We are carrying the torch into the next century! And we couldn’t do it without our members who give so freely of their knowledge, their ideas and their time. We thank you all.